As of today, I've been unemployed for a month. As of today, I'm officially feeling a bit panicky. I've revised both resumes (health/education/non-profits and retail/consumer products) and I feel pretty good about them, but I can't send them out to my network of 181 professional contacts until I write the all-important cover letter(s). And I can't write the cover letter(s) until I finish this short-term freelance job -- consulting on a computer game for at-risk youth. 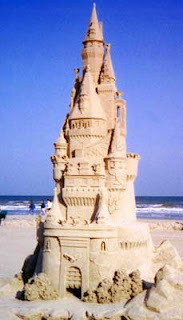 If I could line up a few of these gigs, I could continue a business a started 20 years ago, called Sandcastle Designs. At that time I designed a game for The Learning Company. Now I could do content development, design, and educational consultation for kids media -- film, print and software. Hmmmm... maybe it's time to consider "hanging a shingle" -- or building a castle -- again?! You know, a consulting contract doesn't really count as unemployed. One temporary contract makes for a lean income, but consulting is work, and getting paid for it means income. So you are not unemployed. you lack (perhaps just for the moment?) steady work, but you are not unemployed. Why not hang the shingle? I'll Take the Work-at-Home Option, Please! Well, Well... Aren't WE Pleased?! Kid and... Visions of Grandkid?! "I Need a Damn Washcloth!"